None of the artists on this in-depth Soul Jazz compilation went on to achieve Bambaataa levels of fame, but nearly 35 years removed, that early hip-hop flavor remains as fresh as ever. "I pledge allegiance ... to the groove ..."
-- Count Coolout, "Rhythm Rap Rock"
It's been said before but let's say it again: all of rap music as we know it today can be traced back to three songs, each iconic and groundbreaking in their own way. The first, of course, is the never-ending party jam that is the Sugarhill Gang's "Rapper's Delight", released in 1979. The second is the cybernetic electro-rap mastery that was Afrika Bambaataa and the Soulsonic Force's "Planet Rock" in 1982, which proved that rap music -- as a "genre" -- could actually belong to any genre, electronic music and dance beats working in harmony in ways no one had ever heard before. The final part of the triptych is, of course, Grandmaster Flash & the Furious Five's "The Message", which elevated the rhyming-for-the-fun-of-it party atmosphere into something more profound and personal. While rap definitely existed before 1979, "Rapper's Delight" nonetheless proved to be the mainstream breakthrough it was looking for, and although the three songs mentioned above certainly garnered attention, major labels at the time thought the genre was an unproven property, which meant that the whole reason rap got out into the streets in the first place was due to a series of regional independent labels that were taking a genuine chance in trying to get these scrappy new songs out into the world. 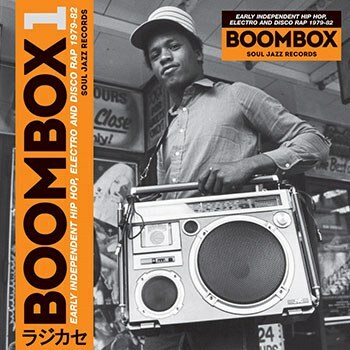 Yet for Boombox: Early Independent Hip Hop, Electro and Disco Rap 79-82, Soul Jazz Records has done what it has always done, which is go full-on into a niche genre and dig up all the gems it could find. Soul Jazz has touched on everything from gospel-soul hybrids to tropicalia travelogues in the past, and in creating a two-disc set of mostly-unheard electro-rap rarities, they pulled out all the stops, starting with the fact that few of the tracks here adhere to conventional run times. In fact, the shortest song here is the Disc 1 opener, "At the Place to Be" by Mr. Sweety G, which itself comes in at 5:10 (for contrast, Disc 2 closer "Equidity Funk" by Mistafide clocks in at 11:22). The remarkable thing about the influence of "Rapper's Delight" is that by being one of the first ever creations of the genre, it's 14-plus-minute runtime meant that what followed didn't have to adhere to any set notions of time constraint, which several artists on Boombox used to full effect. Stuart Baker's truly illuminating liner notes help set the stage for the origins of hip-hop. They touch less on each individual track and artist featured, and instead, they going into great detail about the genre's significant sign posts along the way. They note how early on, samples were discouraged, most rap artists featured live backing bands, which, admittedly, did nothing more than vamp on the same melody line over and over again, more often than not culling their sounds from obscure (and heck, sometimes even well-known) disco cuts, the band Chic in particular proving damn near limitless in terms of grooves from which to choose. Yet much like past releases, Soul Jazz avoids the trappings of being a mere history lesson by neglecting to include the Sugarhill Gang, Afrika Bambaataa, and Grandmaster Flash altogether and instead focusing its efforts on relatively unknown cuts and talents. While Mr. Sweety G's "At the Place to Be" is a fine opener and tone-setter (yes kids: this is a party album through and through), things don't really pick up until we hit Love Bug Star-Ski and the Harlem World Crew's "Positive Life", which uses deep bass grooves, cowbell, and horn stabs to help give the backing track that full-bodied feeling, disco synths permeating throughout. Musically, Boombox is very energetic but also very monochromatic, so many songs pulling from the same tropes while lyrically, all around, everyone's flows and styles circle the same good-time/pre-D.A.I.S.Y. Age vibes that one has grown to expect from early hip-hop, two songs by two completely different artists featuring nearly identically paraphrasing of the exact same line, both groups advocating for you to "kick off your shoes and relax your feet." Throughout, there are phrases we've heard many times before ("Clap your hands everybody / And everybody clap your hands" commands Willie Wood and the Willie Wood Crew on their appropriately-titled song "Willie Rap"), but here, they are delivered with earnest intent, their flows simplistic and built almost entirely on end-rhymes (nothing internal) but rarely, if ever, tapping the brakes on such a good time. Even if things do start to feel a bit repetitious after awhile (especially across two whole discs), there are still genuine great takeaways to be found, whether it be Sweet G's next-level boasting on "Boogie Feelin' Rap" ("I'm the Clark Gable of the turn tables") to the fantastic female guest spot on Bon-Rock & The Rhythm Rebellion's "Searching Rap" to the downright silly "Cop Bop" by Portable Patrol, which avoids the common traps of playful boasting and party-rapping by tying everything to a silly narrative about "the Disco Cop" (who came here to bop). Even in its nascent stages, there was still a fresh amount of innovation to be found from this very precise slice of rap's early days, and while many of the artists here may have been lost to the ages, at least with Boombox they get one more chance to invite you in to their never-ending hip-hop party.